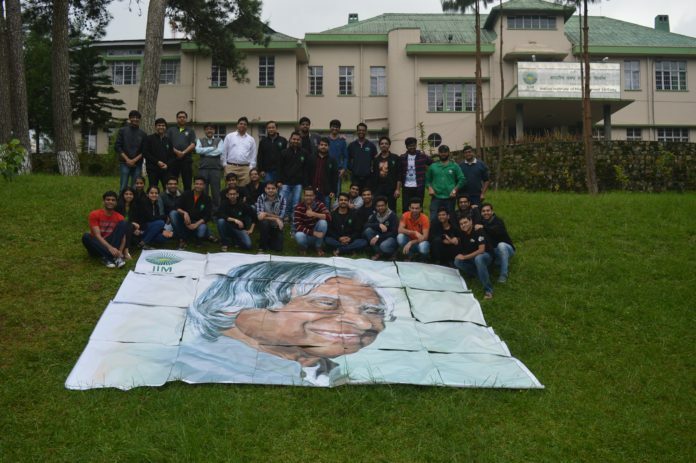 Shillong: Cherishing the ever-lasting bond shared with Dr. A P J Abdul Kalam, Indian Institute of Management, Shillong remembered him and his persona on the 15th of October, recognized as the World Student’s Day by the United Nations. The institute continues to treasure its affiliation with Dr. Kalam, a union fostered and made strong by enlightening guest lectures and invaluable counsel. Marking this occasion, the Institute organized a Shradhanjali wherein the public was invited to the college to pay tribute to the Missile Man of India and remember his impactful life and legacy. The college witnessed scores of people coming and paying homage, remembering his ideas and what his imagination was for India’s future. The students came together to create a mosaic of Dr. Kalam. The activity engaged all the students and as the mosaic started taking shape, his iconic smile made the participants smile as well. One of the students talked about how listening to the first-person stories from the alumni and the faculty has given him a new perspective about Dr. Kalam’s vigor and determination towards educating the students. Wanting to thank the soldiers on this very special day, the students and the faculty of IIM Shillong wrote postcards to the sentinels of this nation, the armed forces, thanking them for their service. These postcards were subsequently presented to the army men posted at Assam Rifles in Shillong. It was an enriching experience for the students as the jawans were enthralled to read the good wishes they received from the participants. 15th of October will be impressed in the memories of this college and its participants, a day when they come together and paid homage to Dr. Kalam, a guide for the institute and for the nation.